Los Gigantes (The Giants) is aptly named after the Acantilados de los Gigantes; large, striking cliffs that surround this attractive holiday resort. The resort is set on the west coast of Tenerife and is essentially joined together with its neighbours, Playa la Arena and Puerto Santiago, to provide visitors with an exciting resort experience. A concerted effort has been made not to destroy the natural beauty of the town and as such there are none of the towering hotels common to other Spanish tourist resorts. The scenery is dominated by a rocky cliff which is 2,600 feet (800 metres) high in places. The resort is self-sufficient, with plenty of shops, restaurants and activities to keep holidaymakers entertained, well-fed and happy. Los Gigantes is a peaceful resort, ideal for a relaxing holiday. Uphill from the marina is the resort's commercial centre, with plenty of shops ranging from supermarkets to upscale fashion boutiques and a convenient pedestrian zone near the church. The nearby village of Masca also has a few independent souvenir shops that sell unique items like local pottery, liquor made from bananas or honey, and embroidered tablecloths and clothing. Los Gigantes is a good resort for shopping and the proximity of a number of other resorts and villages ensures there is plenty of variety. There are quite a few restaurants and bars at the marina, and seafood is the local speciality (paella is always a good bet in the coastal regions of Spain!). While at the popular holiday destination of Los Gigantes, it's essential to sample the fine cuisine at Krishna's. El Rincon de Juan Carlos and Jardin del Sol also garner rave reviews from foodies and casual diners alike. Guests may not smoke indoors in most restaurants, but smoking is allowed on covered verandas and in marked areas. Although Los Gigantes has a selection of bars and even nightclubs, it is a peaceful resort and does not have an energetic nightlife. 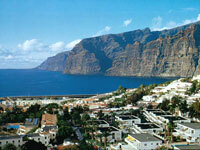 Much of the live music and entertainment in Los Gigantes is provided by the hotels and restaurants. You'll hear jazz, salsa, rock music, and the local folk music called Tenderete. Most of the bars and clubs in the resort are centred in Santiago Bajo. Los Gigantes has a lovely, upmarket marina, which visitors can use as a starting point for boat trips to explore the imposing cliff-faces, enjoy dolphin and whale watching excursions or trips to neighbouring resorts. The resort's small beach has black volcanic sand and good swimming conditions and neighbouring Playa la Arena offers a larger version. There are also a number of water sports and activities such as big game fishing on offer, and those who hire a car will find many interesting sights and sounds in the surrounding areas. A not-to-be-missed event in the town is the annual carnival held in the week after Ash Wednesday. Visitors will find that although Los Gigantes is not party central, there is still plenty to see and do year round. Los Gigantes is hilly, with narrow streets that can be difficult to traverse for people with mobility issues. Youngsters in search of a party may be disappointed with the sedate nightlife.